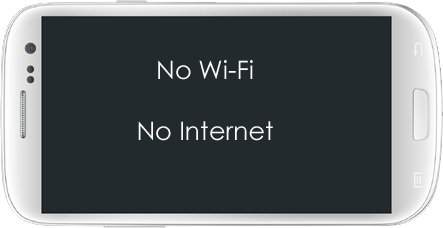 Wi-Fi connection problem is very common in mobile phone, smartphone, tablet and phablet. There can be several reasons for this Wi-Fi Connection Problem and there is different Solution for different reasons. Here I will explain all about Wi-Fi connection problem and how to fix this issue. There are situation when a mobile cell phone of any brand including Samsung, Nokia, LG, iPhone, Micromax, China Mobile Phones etc may give problems such as Wi-Fi wireless internet connection. Enable Wi-Fi and check if it is working or not. Make sure you are connected to a wireless Wi-Fi Network. Make sure the password is correct. If the Wi-Fi cannot be enabled and you are not able to use or access internet then there could be problem with the Mobile Phone PCB or the WiFi Controller IC. You may have to replace the IC or the PCB itself. If the Wi-Fi can be enabled then there is no problem with the PCB. Just upgrade the software / operating system (OS) of the mobile phone or smartphone to the latest version. This should solve the problem. In my personal experience, I have observed that most of the time there is Wi-Fi connection problem and we do got get the wi-fi signal in our mobile phone or smartphone because there is some problem with the source of the wi-fi. Either the Wi-Fi router is switched OF or its power adopter or plug is not inserted properly in the power source or the switch is OFF. Reload / Flash the OS. Meski tlh diriset ulang masih sama saja !! Wifi is not bs connected lenovo s90_a Though tlh resis is still the same !! Is the WiFi IC Ok? namaste sir,mera mobie intex aqua ice mini hai mere mobile ka wifi on nahi hora ,bluetooth same problem bata raha hai,torch work nahi hora hai,hotspot bhi work nahi ho para hai aur kohi update bhi nahi bata raha hai software ki.please kohi solution dijiye. Get the Operating System Flashed by Some Experienced Technician. If it is Android then you can do it yourself very easily. Just have patience when flashing is ON. I will post a Article and Video on How to Flash Android Mobile Phone. Reload the software and check. If the problem is not solved by Updating the software then you may have to change the WiFi + Bluetooth IC. Santosh, I have an Intex Aqua Power, with android version: Kit kat . All of a sudden I found that the wifi got disconnected and since then, the mobile is trying to enable the wifi continuously but cant get connected. Its not even turning OFF. Bluetooth is also not working. I did hard re-set the phone as well, but no change. What do you suggest? You need to change the WiFi IC. sir,i have lenovo s90 phone and it won’t open wifi.when ever i want to open it doent open.so kindly help me for this problem. Try to RESET the phone and Try Again. Check settings. Download my GPRS Settings App from Google Play Store.